Whisper it quietly, but Delta and United are dependent on Gulf carrier connections for their Middle East flights. The larger US-Gulf carrier partnerships are between Emirates and JetBlue, as well as American Airlines with both Etihad Airways and Qatar Airways. The latter two are intriguing as American is forcefully involved in the allegations against Gulf carriers; JetBlue is not and in fact strongly supports the Gulf three's expansion. JetBlue will for example open an Orlando-Mexico City service to take feed from Emirates' new Dubai-Orlando service. With Emirates going double daily into Seattle, it could look to replicate with local carrier Alaska Airlines the partnership it has with JetBlue. 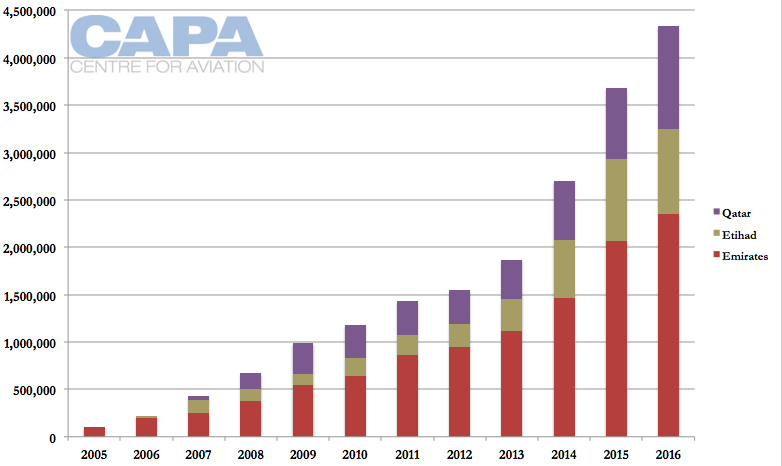 Etihad in Mar-2015 said it placed 180,000 passengers onto US carrier networks in 2014 – 493 a day – as well as 50,000 in the first two months of 2015, or 847 a day; around a fifth of Etihad's US passengers connect to a US airline. American Airlines has been a primary recipient of this traffic and has realised the traffic opportunities it is leaving behind. With Etihad serving Dallas-Abu Dhabi only three times a week, there is opportunity for American Airlines to launch its own service to Abu Dhabi and expand its partnership with Etihad. A deeper Gulf partnership will help American, but they are not alone among north American airlines whose interests may be best served by closer links. Gulf partnerships are important to the three big US airlines, American most obviously given its codeshares with Etihad and Qatar. But Delta and United also benefit. It is understood about half of Delta's Dubai passengers have an interline connection to Emirates. United's interlines even include one with flydubai, which receives approximately 400 passengers a week, the LCC has said. Although flydubai does not serve North America, it has the same ownership as Emirates and allegations put against Emirates could be used towards flydubai as well. flydubai is also an important partner to sister Emirates. 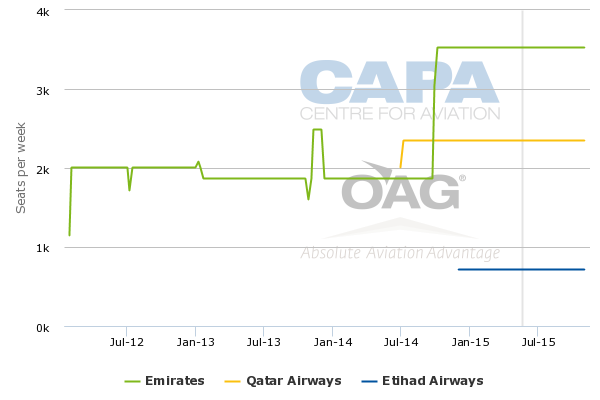 Etihad Airways and Qatar Airways have given indications of their contribution to US carriers. 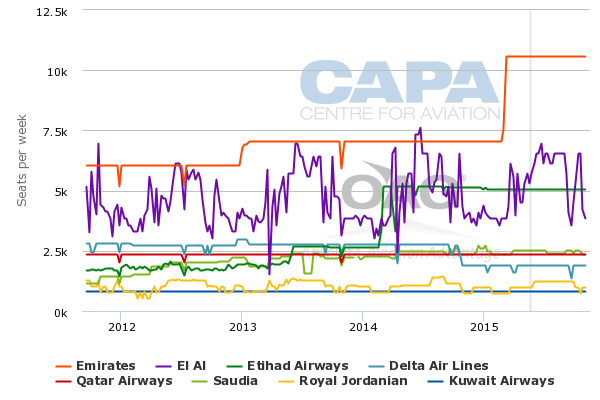 Etihad in Mar-2015 said it placed 180,000 passengers onto US carrier networks in 2014 – 493 a day – as well as 50,000 in the first two months of 2015, or 847 a day. Etihad in the first two months of 2015 operated approximately 280,000 seats to/from the US. 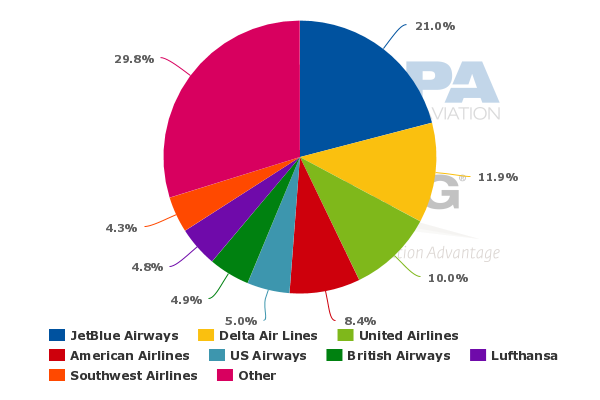 Assuming an 80% load factor and that all of Etihad's connections to US airlines occurred within the US (and not over third country points, such as in Europe), then 22% of Etihad's Abu Dhabi-US flights connected to a US airline. The figures are approximate – American and Etihad have numerous codeshares over European hubs – but give an indication of the current scale, even before planned expansions occur. Qatar Airways has calculated a revenue benefit, saying it transferred over USD60 million in revenues to its US partners in 2014. Growth is unsurprising as Etihad has added service to the US while expanding its codeshare with American. Its growth in 2014 was particularly high, and that capacity is only being realised on a full year basis in 2015. And, of course, there is JetBlue, which partners with Emirates (and 34 other foreign airlines) and receives a substantial revenue boost as well as ability to open new domestic routes and provide competition. This will be discussed later. No US airline is as involved with Gulf carriers as American Airlines. American had been partnering with Etihad Airways while Qatar Airways' entry into oneworld saw American partner with Qatar too. For both carriers, American codeshares on their US-Gulf services, flights from Europe to the Gulf, and services beyond the Gulf – such as to Bangkok. As far as the American-Qatar relationship is concerned, oneworld alliance members are not required to codeshare with each other. American is most compromised in its rhetoric by these partnerships. American has expanded its Etihad partnership progressively, adding more codeshares as well as making it easier for its frequent flyers to earn miles when flying on Etihad. Previously American's website said frequent flyers could not earn miles when flying on Etihad between North America and the Gulf unless they were booked on an AA codeshare, which was often more expensive than Etihad's own rates. This restriction was removed from the AA website in May-2015. On its website Etihad lists all the US connections it can offer via American that include approximately 15 from Los Angeles, two from Washington DC, roughly 24 from Dallas/Fort Worth and more than 90 from Chicago O’Hare. During the high level panel debate at CAPA's Americas Aviation summit in Las Vegas examining the nature of the threat posed by Gulf airlines, Etihad general counsel and company secretary Jim Callaghan offered a real example of the opportunities Gulf airlines offer to US airlines. On a flight to Los Angeles operated by an Etihad Boeing 777 with a 225 seating capacity and 215 passengers on board, passengers from 18 destinations joined the flight at Etihad’s hub in Abu Dhabi. Only two of those destinations are served by US airlines, he stated. Roughly 31 of those passengers transfer to US domestic airlines, including US majors, said Mr Callaghan. Publicly, American's response to this has been equivocal. American Airlines SVP government affairs Will Ris, speaking at the CAPA Americas Aviation Summit, said the airline could be good partners with Gulf carriers, provided any agreement was entered on equal terms. This language is far from Delta's and United's and suggests it has been cajoled into this arena. It may be willing to participate in hopes of securing more favourable terms for a partnership. Qatar Airways CEO Akbar Al Baker expressed disappointment that American was expanding its relationship with Etihad, and that Qatar would look to grow its partnership with JetBlue (this is especially relevant in Boston). Mr Al Baker also opined that American Airlines CEO Doug Parker was under the influence of Delta Air Lines CEO Richard Anderson. American's dual partnerships with Etihad and Qatar suggest the seeds may be there for a partnership in the medium term. This may happen sooner rather than later as it considers launching service to Abu Dhabi. American Airlines could deepen its partnership with Etihad by launching flights to Abu Dhabi. It is understood American has evaluated Dallas-Abu Dhabi service for its 777-300ERs and could serve the route on the days Etihad does not; Etihad offers only three weekly Dallas-Abu Dhabi flights. Etihad launched three weekly flights to Dallas in Dec-2014 and planned to offer daily service in Apr-2015, but in Jan-2015 delayed the frequency increase to at least 2016. Etihad did not give an exact reason but it is understood Dallas is not performing strongly for Etihad. A joint American-Etihad service that matches Qatar's size would be a larger competitor to Emirates than Etihad alone is today to Emirates. American's partnership with Etihad has given American the insights into the large number of passengers transferring from its network to Etihad. American could also link new markets and deepen the penetration of existing markets Etihad has access to. As noted, American already codeshares on Etihad flights beyond Abu Dhabi. American's placement of its own metal on the route would change route dynamics since codeshares are not a full substitute. American would be the last of the big three US airlines to serve the Middle East, but it could have the highest strategic value of US airlines serving the Middle East. (It is understood Delta has seen declining performance in its Dubai route.) As there is open skies between the US and UAE, a metal neutral JV is a serious possibility. A JV with a Gulf carrier could bring revenue benefits to American: under its European JV, revenue is shared only across the Atlantic with American receiving a fixed sum for flights beyond. A Gulf JV could allow American to capture a higher share of the revenue of passengers travelling to the Middle East, India etc. Emirates has long courted American, way before Emirates disclosed its partnership attempts in Sep-2012. The serious enough evaluation of Abu Dhabi service (which is understood to have Etihad's blessing) implies American does not think it can reach a satisfactory deal with Emirates. Each brings remarkable size (and further, American brings a more refined mindset than the more protectionist Delta) so there is an interesting negotiating dynamic at play here. Each side might evaluate what it needs to give, and if doing so is worthwhile. Emirates may have more to gain – and lose. Extending the American-Etihad partnership with American metal in Abu Dhabi would make it more difficult to unwind that relationship, but then the evaluation of self-interest varies as the market changes. Emirates' selection of Orlando as its newest destination (service from Sep-2015) is perhaps unsurprising. 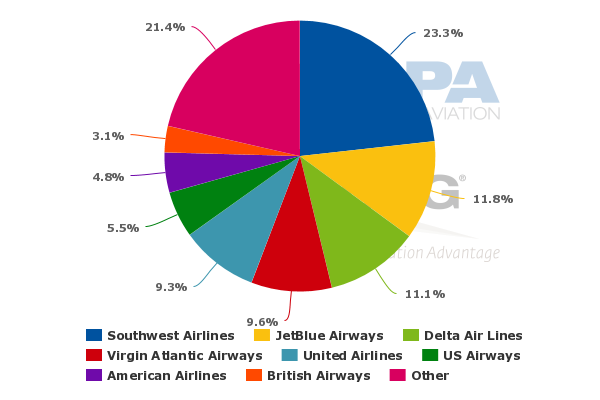 Orlando has been the largest beyond market in the Emirates-JetBlue relationship. Other key points JetBlue handles Emirates traffic are to further points in Florida (Tampa, Fort Lauderdale, Jacksonville, West Palm Beach), upstate New York, Los Angeles and San Francisco. In the US regulatory filing, the so-called White Paper, the three US airlines said in 2014 they carried over 11,000 passengers between Orlando and Delhi/Mumbai and over 5,000 passengers between Orlando and Bangkok. The carriers said those are "passengers that US airlines are now at an even greater risk of losing because of subsidized service to Orlando...those passengers will be siphoned off via a subsidized Gulf hub". The Delhi/Mumbai traffic equates to 30 passengers a day and Bangkok about 14. Emirates will be able to carry those passengers over Dubai. Previously US passengers would have had to fly to a US hub to access Delhi and Mumbai, and selections are limited (and American does not serve India at all). Further, they would have had to take a domestic US flight – perhaps without any complimentary food and usually of considerably lower product quality than Emirates. Emirates will be able to link around a dozen Indian cities other than Delhi and Mumbai with one-stop service to Orlando, which Delta and United could not offer. As for Bangkok, no US carrier has a non-stop flight from the US to Bangkok, meaning an itinerary on a US carrier would have required two stops; Emirates will be able to offer one-stop service. While there are many benefits for the Dubai-Orlando service on the beyond Dubai portion, Orlando as a hub should not be overlooked. Emirates partner JetBlue has the second largest presence at Orlando, giving Emirates’ passengers one stop access to many Latin America and Caribbean destinations. As a result of Emirates' Dubai-Orlando service, JetBlue will open a service from Orlando to Mexico City. JetBlue had been looking at the route for some time, and the opportunity for connections from Emirates would have improved the commercial viability. Emirates' service arrives into Orlando around midday and JetBlue's flight will leave in the evening while on the return the connection will be more favourable with JetBlue departing Mexico City in the morning and Emirates departing Orlando in the early afternoon. Emirates has been interested in Mexico City for some time but the airport's high altitude has effectively prevented non-stop service from Dubai. Routing Mexico City passengers over Orlando with JetBlue helps Emirates sustain its Orlando presence – something US airlines have not done, withdrawing international long-haul flights from Orlando a decade ago. Delta's announcement of Orlando-Sao Paulo service restores US long-haul service to Orlando, but to Sao Paulo – a route that will not connect to the markets Emirates will. Delta's announcement comes only after Azul enters the Orlando market, suggesting a level of inertia from the major US airlines in long-haul development. Each time one of our 35 international partners operates a flight to the United States, JetBlue benefits with new customers. For example, when Emirates, Turkish Airlines or Japan Airlines arrive at JetBlue’s focus city at JFK and customers connect onto our network, JetBlue increases traffic flow, has a need to add capacity and as a result, adds direct jobs just as others (taxi operators, hotels, restaurants etc…) add indirect jobs. At our focus city in Boston, many of our international partners have launched or announced new services including Turkish, Hainan, Japan Airlines, Cathay Pacific, El Al and Emirates. Each of these new international flights not only adds direct aviation sector jobs in Boston and indirect travel and tourism jobs in the region, but also strengthens JetBlue’s ability to launch new competitive domestic routes such as Boston-Detroit based on the large flow of arriving international connecting customers. In the year since JetBlue entered the former Delta monopoly route BOS-DTW, fares have fallen nearly 40 percent and daily passenger traffic has more than doubled. All of this activity increases job growth. Similarly, at our Orlando focus city, our domestic network has grown as we have added international connecting partners including Emirates, Icelandair and others. There is a strong link between Emirates' new Orlando service and JetBlue's new Mexico City service. This follows a previous pattern. On the same day Emirates launched service to Boston, JetBlue initiated service to Detroit, which has a solid portion of its population with ties to the Middle East. JetBlue is the largest carrier at Boston. The feed supplied by Emirates generates new passengers for JetBlue, while at the same time heightening domestic competition for Delta, which until JetBlue’s entry had a monopoly on the route. ULCC Spirit Airlines has also added flights within the last year. The Boston-Detroit expansion is an example of how airlines not affiliated with an alliance can partner and add legitimate competition to a market in a post consolidated US industry. Recently, Mr Hayes stated that "as a frame of reference when we started Boston-Detroit, the average non-stop fare paid between the two cities dropped from USD266 to USD163, a decrease of 39% - and passenger traffic more than doubled". Mr Hayes stated that since Mar-2014 when Emirates launched Dubai-Boston JetBlue Boston-Detroit launch, "we're seeing traffic from around our network flow through Boston onto Emirates and other partner networks at a rate well above our expectations". 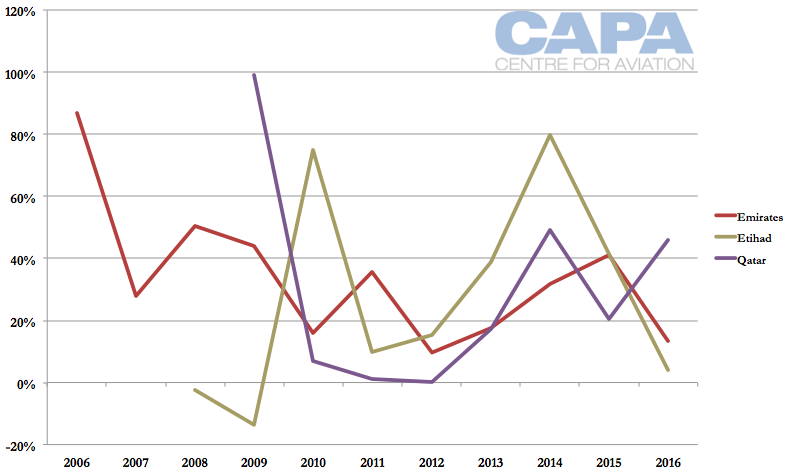 CAPA previously concluded before Emirates announced the added frequency to Boston that if the Gulf airline expanded its service to Boston, JetBlue would receive some bump in revenue; this will no doubt occur when the second daily flight begins in 2H2015. The JetBlue and Emirates partnership also benefits markets such as Cleveland, which has suffered as United cut a significant amount of service from its smallest hub. Both JetBlue and Spirit have launched flights from Boston to Cleveland within the last year, breaking United’s monopoly. In JetBlue’s case, it is likely receiving some small feed from Emirates on the pairing, and offering a level of connectivity that the three US majors choose not to participate in from Boston. The importance of JetBlue to Emirates is demonstrated in Emirates' third daily non-stop Dubai-New York JFK service. (Emirates also has one-stop service via Milan.) Without the JetBlue partnership Emirates would be unable to sustain such a large presence in New York. The third daily flight departs Dubai at 14:50. This is during the third hub bank Emirates is building up, and is challenging as the high afternoon heat during much of the year causes operational restraints. The JetBlue partnership however has given Emirates the strength to continue to expand in New York. By now a recipe has been established for Gulf-US partnerships. JetBlue is the big winner, but Virgin America – with Los Angeles and San Francisco presences – could look to make more gains. Emirates already partners with Virgin America. Meanwhile with the addition of a second daily Dubai-Seattle flight, Emirates could replicate with Alaska Airlines what it has with Emirates. The benefits that airports such as Boston and Orlando derive from foreign airlines as a result of open skies and the expanded choice for consumers only scratch the surface of various facts that underlie the US debate. Subsidy rhetoric aside, US carriers must prove damage. Their own figures for Orlando indicate Emirates will provide a better service to the US economy. No carrier will offer a non-stop itinerary but Emirates can argued it will offer a better product on overlapping one-stop itineraries while opening a number of one-stop services the US carriers offer with two stops or not at all. Among the the big three US airlines making their case for the opening of government-to-government consultations with the UAE and Qatar on open skies agreements, American's posture is most subject to scepticism as it straddles the stance of opposing expansion by the Gulf airlines to the US while benefitting from their feed. A "natural" evolution would be a deeper partnership that gives American stronger access to this traffic. Such a defection would be near impossible in the short term, given the depth of the hole that the White Paper and associated publicity represents. Implicit in this too are the de facto commitments apparently being made by the airlines' leadership to pilots' unions which seemingly have a massive investment in securing a protected marketplace for the big three airlines. For the time being talk of deeper partnerships can therefore be no more than speculation; but the scale of potential economic benefits for American Airlines or the other major carriers surely make the eventual outcome irresistible. Meanwhile, the US airlines' European partners will be watching with more than academic interest and each round of capacity and fares negotiations between them will be tilted in favour of those airlines who have alternatives for the future.